As soon as I retired from public education, I created a dedicated space to ponder, reflect, and converse about life, literacy, and learning. 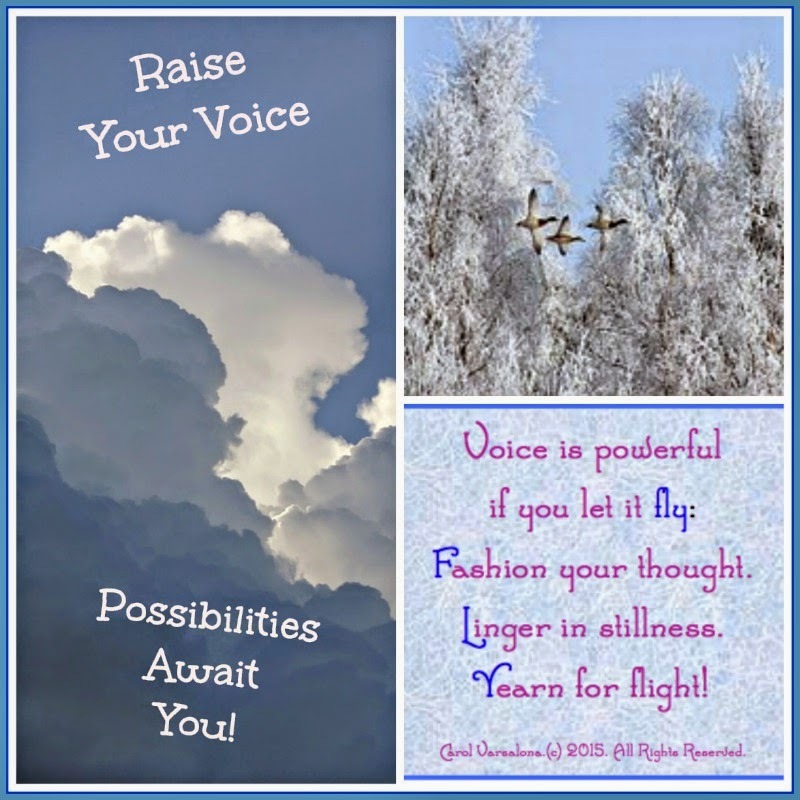 It is here, at my blog site, that voice has been my connector to educators across the globe so this week, I celebrate voice and the opportunities writing brings. #1 The joke in my household is "tell me when you really retire" as I walk out the door early in the morning to travel to a district or BOCES center to deliver professional development training on some aspect of literacy learning. What started out on July 24, 2013 as an "unretirement" state of mind has now slowly grown into professional pursuit. I am enjoying working with different teachers across Long Island as we grapple with ways to create a culture of trust and positivity and impact teaching and literacy learning. This week I broke all records with four days of presenting. (This is not the norm but because of the extreme weather conditions, professional development had to be postponed in several instances.) I celebrate the pursuit of "unretirement" opportunities. #2 I celebrate the ease of creating presentations in Google Drive and now converting then into Google Slides to share with educators. My thoughts are now being housed in the cloud for easy access. Long gone are the days when I forget to download presentations on flash drives and wonder what to do. Google Slides on Drive have provided me with a new avenue to worry free presentations. #3 I celebrate the creation of inspirational images to provide messages of positivity. I release images like the one below across the Twittersphere. 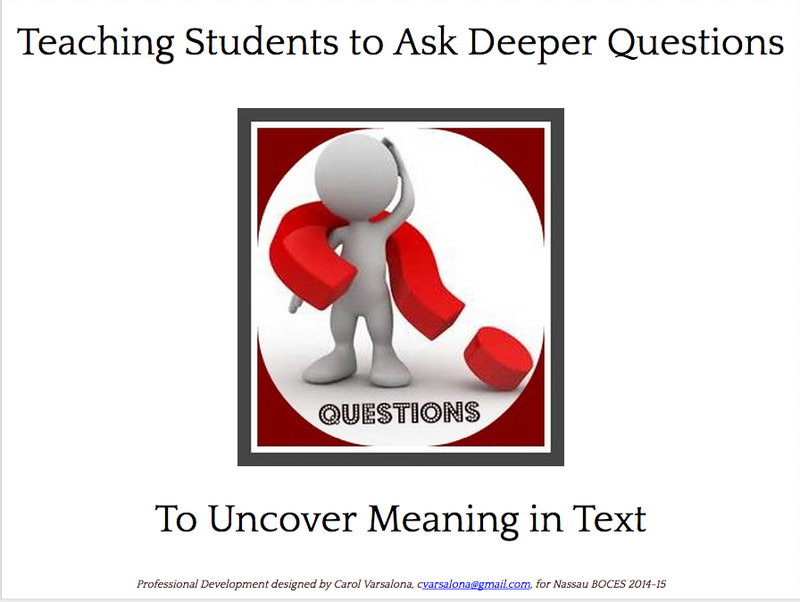 There are for teachers to use in their classrooms or for PLNs. Motivating everyone to raise their voices with others across the globe is a focus for me this year as I listen more intently. #4 I celebrate new to Twitter teachers I worked with this week who are intrigued about new possibilities that await them in the cloud. Here is my tweet that I sent out this evening. #5 I celebrate the many educators, business contacts, friends, family, and even three elementary students for participating in the Finding Fall Gallery that I just updated with a poem that was hidden under an image when the gallery first went to post. Please enjoy a stroll back into autumn to read different perspectives on the season before I start designing the next collection, Winter Whisperings. Enjoy your weekend as you find the positives that lead to daily celebrations! Voice Counts. Let it be heard. 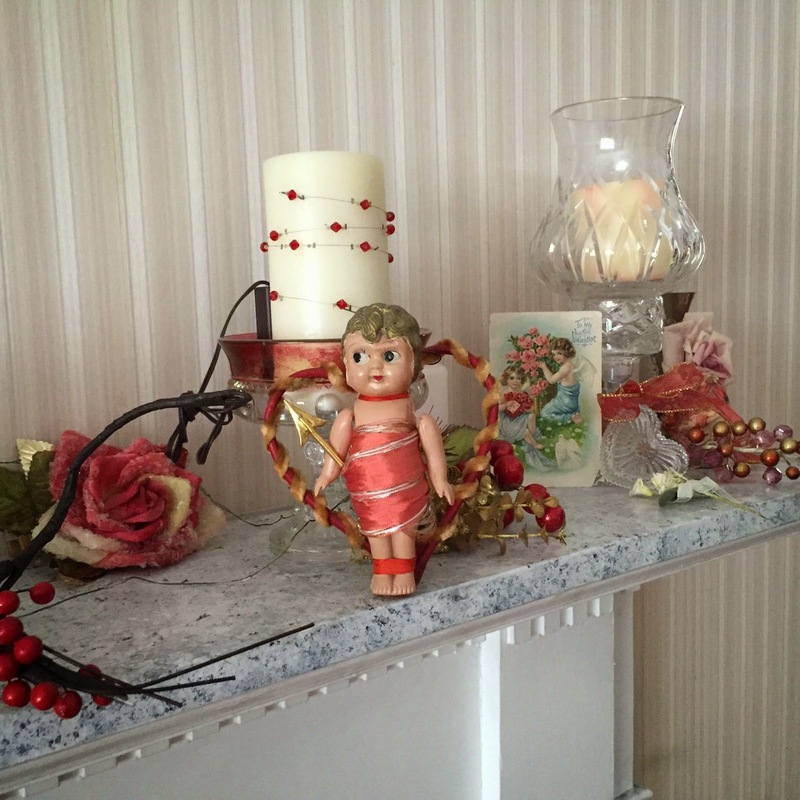 Now stroll over to Ruth Ayres' Celebrate This Week site to read the blogging community's posts on their celebrations this week. At each new turn of life, there awaits a chance to renew your spirit. Building a journey around one little word helps define the path to start upon. In the quiet of the winter, I have listened, waited to hear the calling, and have tried to step forward each day with a positive spirit. 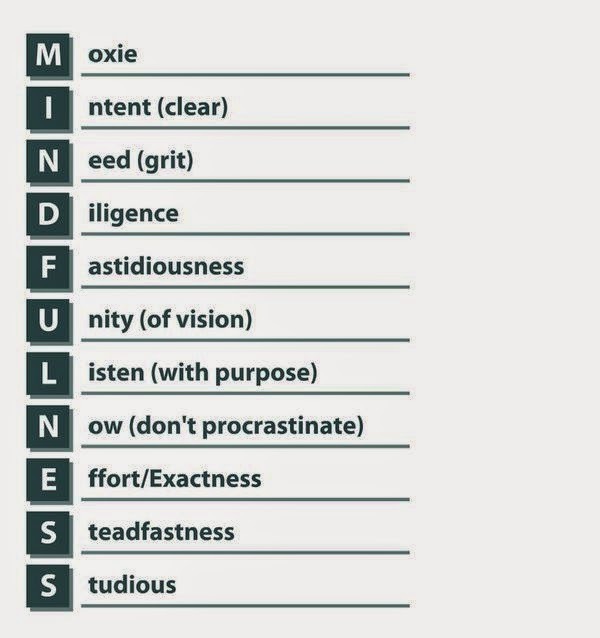 Some fellow bloggers have found their one little words of which I borrowed a few to help me think of ways to continue my pathway to positivity. Thank you to Holly Mueller, Michelle Haseltine, Leigh Anne Eck, and Margaret Simon for the bonds we have forged with our one little word focus. As winter continues to bring its arctic blasts to Long Island, I relax in the thought that there is beauty in each frozen particle that lays at my feet and each whip of air that heightens winter's presence. I am inviting all those who have become dreamers this winter to listen for the whisperings of the winter season that may call you to write alongside me. The Winter Whisperings Gallery challenge asks for only one poem-one photo that brings awareness of how winter has defined your thoughts. Is there a stillness in the whispering you hear--a yearning--a sadness? where she is hosting Poetry Friday and a March challenge. 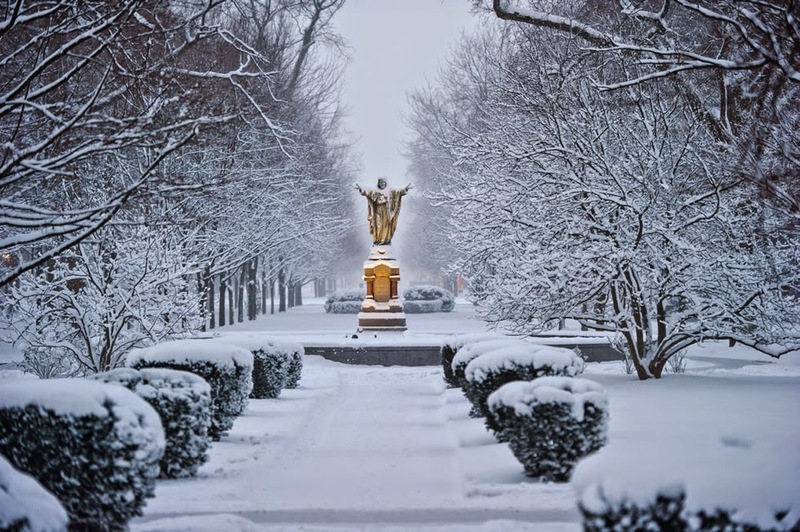 a walkway of peace at the feet of the Lord. to rest in winter's arms. The winds listen for human sounds. dusted by a confectioner's hand-HIS hand. But still no sounds break the stillness. or joy laid at the feet. the One who lights the way. the hem of golden grace. to dive into the fresh smells of spring. for hearts filled with dreams. Winter's touch has quieted the land. until a new season awakens the earth. I hope that this song, Find Your Wings, by Mark Harris, coupled with Psalm 126:12, is a joyful entry into your journey today. The song's touching words may help all of us reflect on our roots, give hope to those finding their wings to set sail on life, and bring into focus the light of the Divine that guides us on our path. 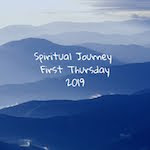 It is here in the spaces of Spiritual Journey Thursday under the guidance of Holly Mueller, that bloggers stretch their limits today to be hopefully refreshed by the snowsun that brings light from above. It is here that we honor our one little words (underlined in the poem), with today's focus on Ramona Behnke's one word, stretch, that guides her journey. I am serving a slice of positivity today with motion and rhyme combined. I say, take caution. Observe your surroundings and step lightly as you move forward. Don't settle for the status quo because there is no moving beyond with mediocrity. Life should be filled with vigor, liveliness, and passion for balanced living so find the beat that stirs within. Wiggle and jiggle until the just right step leads you on and if by chance you take a misstep, don't worry. Pick yourself up and find a new way to cross the path. 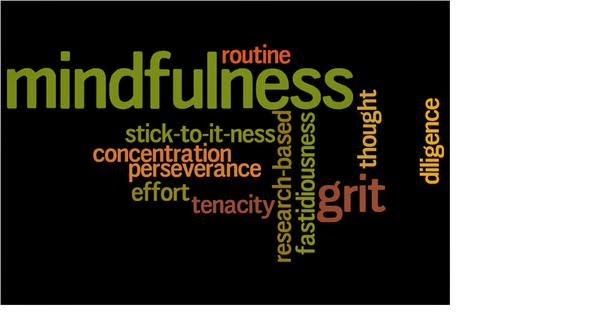 Lately, I have been in and out of many chats, whether face-to-face or on twitter that talk about moving beyond the status quo to achieve fullness. I think, we all look for that in life. Achieving this is the difficult part, so listen to the sound clip, Deep Purple - Smoke on the Water Tab, from the Sound Poem Project-Day 23 on Laura Shovan's site. Swing along with me as I move to the beat of positivity. sweet rhythm for my dancing feet. when mixing with a clapping throng. Sway and step to swinging sound. and fill the space with joy that's found. Come along. Sweep the world with me. opening doors to let spirits free. In a world of many sounds, we are the makers of our own music. We can choose to jiggle and wiggle with positivity or drown in the stagnant waters of mediocrity. As we hear on school announcements, the choice is yours. I choose moving with positive thinking as my guide. 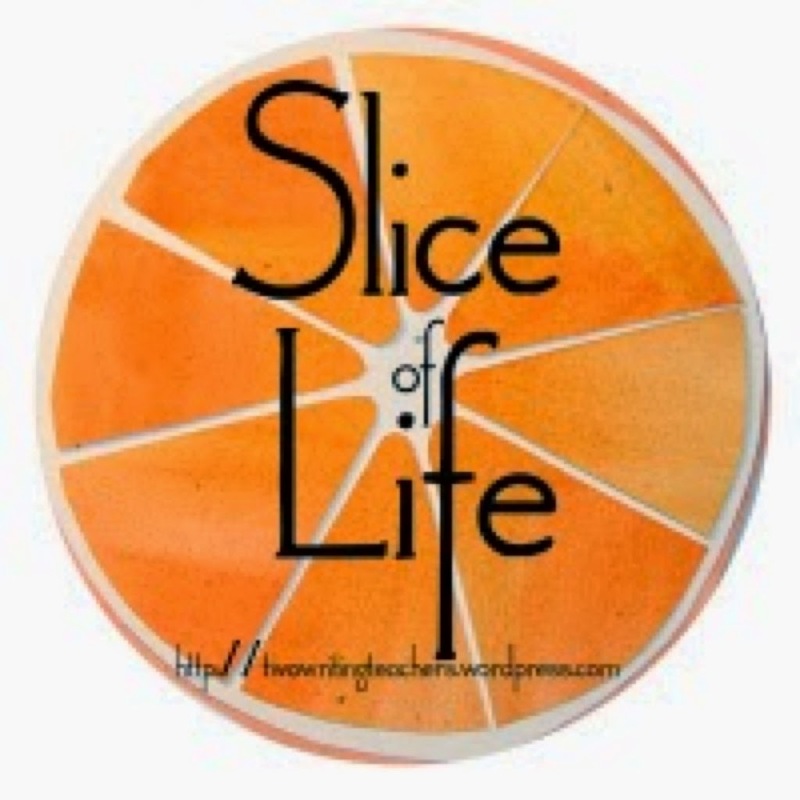 Now, dance your way over to Two Writing Teachers to find the Slice of Life bloggers posting their thoughts this Tuesday. Photographs have always had a place of importance in my life. There were the black and white photos of my childhood. Birthday parties and summer events were remembered and kept in small family albums. During my teens, all the girls had a scrapbook with memories. As I married and had children, each child had a beginning of life photo book. Soon after their births, I returned to teaching and the photos were stored in boxes with the idea that later on in life, I would sort them and place them back in albums. Now, the Digital Age is here and photo collections are able to be stored online. Behind each photographs is an underlying story, the backchannel tale of a life event that we want to savor and applaud. The old saying, a picture is worth a thousand words, has a new face in this digital age. Photos can be easily transmitted now through the instant capture of a single scene with a camera, iPhone, or SmartPhone. Instagram has a one stop, easy access for public viewing of special shots. Digital tools are being advertised via the internet and sites like Pinterest and Facebook store photos with quick uploads. While photography tells stories through images, the fusion of poetry with photos creates another layer of storytelling. 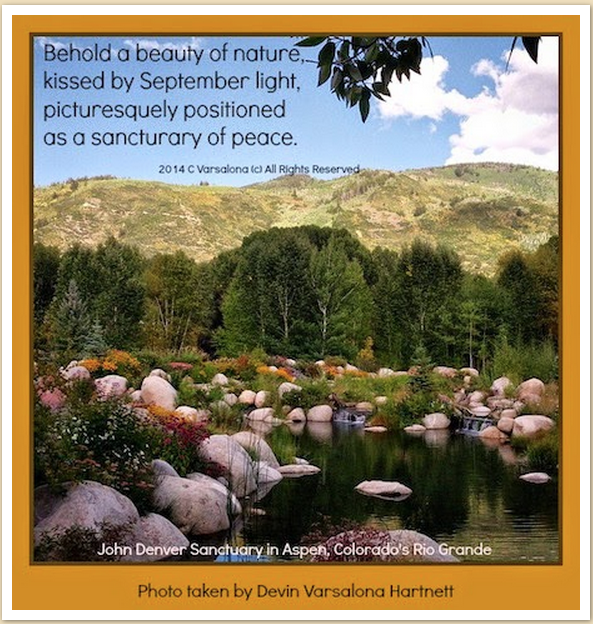 Vibrant images embedded with poetic expressions or poems are engaging readers on Twitter. Educational chats are posting flyers composed of superimposed wording on photographs or images. Free photos sites like Pixabay and Morguefile are stocking their collections with additional images to supply the demand for topic-centered photographs. You can take the process of capturing lasting memories through photos, one step further by adding another layer of creativity. The merging of two arts forms, photography and the written word, allows for the seamless blending of literacy and technology through simple photo-editing tools, like PicMonkey, Canva, and Microsoft Word. The connection becomes a collaboration of the heart and the mind to make public what the voice inside has to say. Multi-sensory feelings are evoked in this process of blending art forms that are transferred from writer to readers and viewers. Let's look at the process of how I create one image for public viewing. In this case, I use a screenshot of an antique postcard dated 1910 and turn the artifact into a jpeg for further use. I decide to create a visual that will enhance the card and have it as a focal point. I use both Canva and PicMonkey to create the following image that I save as a jpeg. 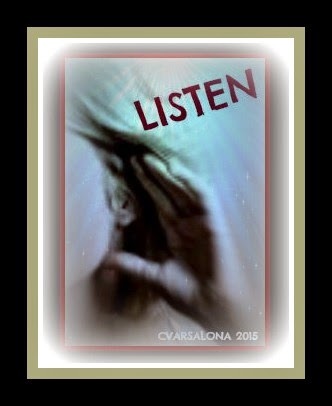 Next, I go to PicMonkey to upload my new image and superimpose the poem that I created from listening to a sound prompt for day 21 of Laura Shovan's Sound Poem Project. The end result is an attractive visual that enhances my postcard and showcases the poem I wrote. The combining of photos and poetry creates a striking visual for viewers. I have designed gallery collections using the technique described. 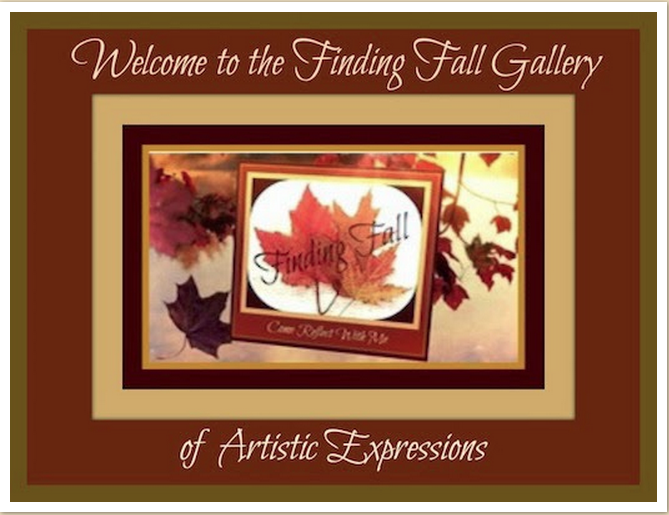 Please view the latest one, Finding Fall Gallery here. To the left is one sample from the collection that was a collaborative effort between the photographer, my daughter, and the writer, me. Photography and writing have always been a part of my life but now this connection is enhanced through digital tools. 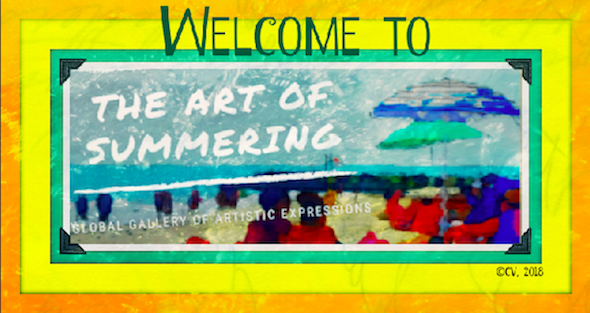 Join me as I continue to make these connections vibrant messages of positivity in the next gallery of artistic expressions, Winter Whisperings. The digital age is providing me with many new outlets to merge two favorite art forms of mine: photography and poetry. Now travel over to Margaret Simon's DigitLit Sunday site to view her contribution, Shades of Grey. During this season, I have been trying to listen intently to the sounds around me. 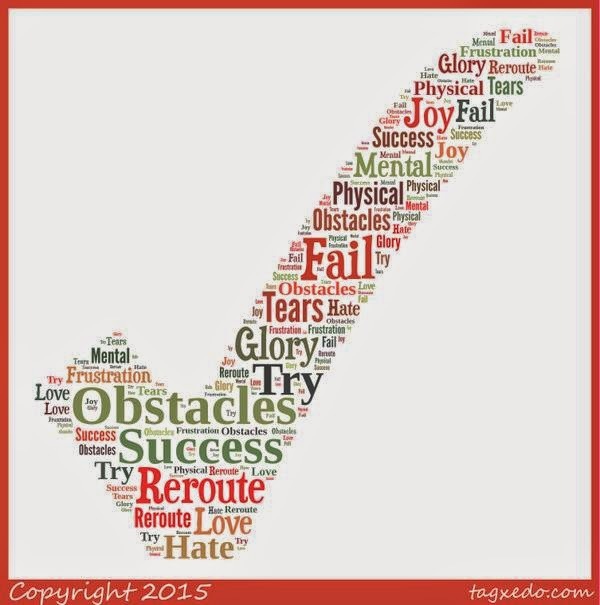 When Laura Shovan advertised her Sound Poem Project, I realized that this would fit in nicely with my goal to follow one little word to guide my journey. For tonight's writing exercise, I listened to a sound clip from Day 21 of Laura's project to become inspired to write an initial entry. Since I have been following the posts, it was time to devote a blog post to the interpreting of sounds found in Laura's project. In yoga, we listen to our breath to hear the sound and allow it to direct our practice. Similarly, I wanted to listen to a sound prompt multiple times to see what it was offering me before I wrote. Although the clip is captioned Colin Huehns Asia Collection, I had a totally different image in mind while listening. Perhaps, my thoughts stemmed from a brief idea that we would travel to New York City today to enjoy Chinese New Year. Since it snowed again, this idea was put aside. As an alternative, I decided to write about what New York City would be like in the springtime. For those who know New York City, it is a vibrant place. One of the most impressive sights in the city is Central Park in springtime. Every inch of space at the entrance to the park is occupied when spring is in the air. Street vendors display their wares as do the food carts. The buggy rides are lined up for those who wish a leisurely ride, and people are everywhere enjoying the opening days of a new season. 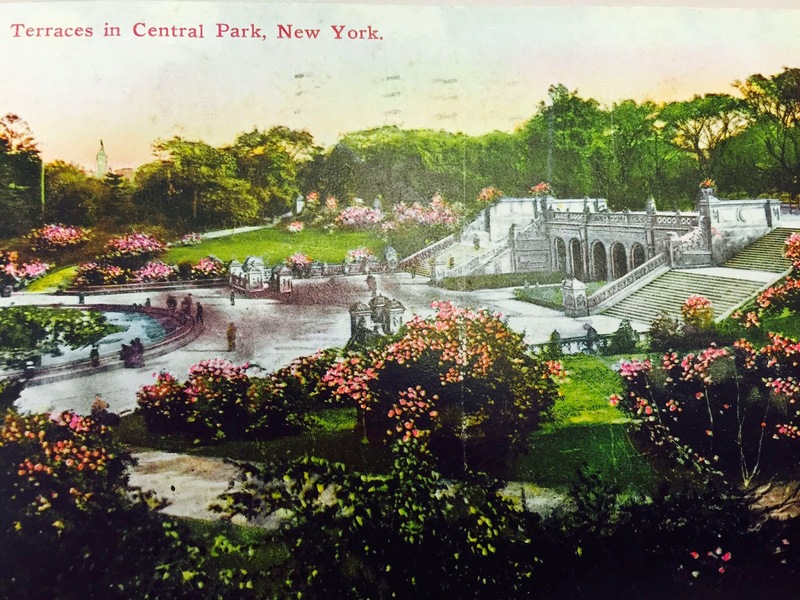 In sorting through my collection of antique postcards, I found one titled, Terraces in Central Park, New York, dated 1910. Diane Mayr actually gave me the idea to have a postcard as a background for writing and Laura Shovan told me that her 2013 Sound Poem project was built around vintage postcards. 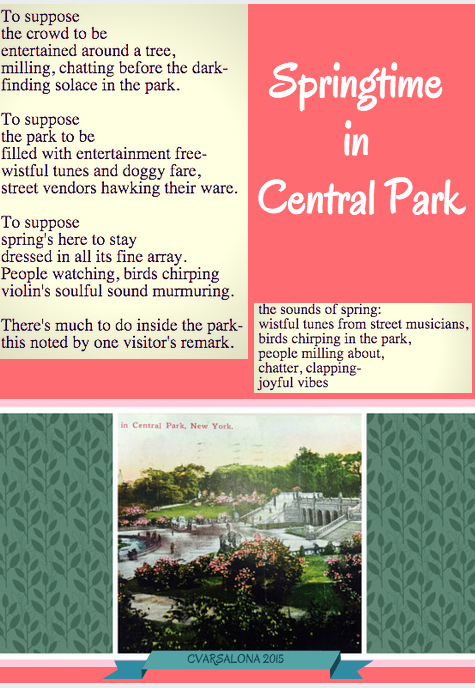 Today's sound clip reminded me of a springtime day in Central Park. There is so much buzz outside and inside the park when the weather breaks. The zoo is thronged with families and the park is filled with leisurely walkers and sprinting joggers. The buggy ride horses are splendidly arrayed in flowers and silken coats. To recreate a portion of that scene based on the sound clip, I wrote two thoughts, one in rhyme and one in free verse. As always, I am open to comments to improve my writing style. Thank you Laura for pushing me on to try something new. As we walk (and sometimes race through) life's journey, there are many moments to celebrate. Some are stellar, some ordinary. The ordinary ones of a routine day can be the jsut right ones that allow for a spark to battle humdrum type of days. From one of those everyday routine days, I found a story to celebrate. It was rise and shine early yesterday for another annual doctor visit. My first notice of the day was the coldness of the tiled floor in the bathroom-as cold as the floor in the doctor's examination room on Monday. This signaled that it must be extra chilly outside. A step into my car confirmed my belief. The temperature may have been 8 degrees but I was ready to brave the cold. Ugg gloves, matching headband, warm boot, and double layers under my coat were my protectors against Mother Nature's blast. My first gratitude of the day came when I turned on the heated seats, heated steering wheel, and warm air blowers. These were enough to think positive thoughts during a humdrum, errand-filled day. When I felt secure against the cold, I thought of my breath. Slowing it down would make me more aware of my surroundings and a positive mindset. As I breathed in, I relaxed into the warm seat. As I breathed out, a stream of white smoke filled the air in front of me. Brr! I repeated the practice another time and once again my breath created a small burst of whitish air. I thought of the warmth of the yoga studio where breath is emphasized to still the mind. That thought served me well. Continuing on the highway, I noticed the sun's glaring blaze. Sunglasses were in order, making me think about the upcoming Oscars. Seriously, this day as cold as it was (lowest in 60 years), made me appreciate the small moments in life when life is full of just the ordinary. I usually rush to appointments and today was no exception but all of a sudden, I caught white billowy puffs against a bright blue sky. They were streaming in a pattern similar to the birds that fly south. There was nothing else in the sky but the flow of whitish smoke. I thought of my breath once again but what I saw was so much larger and organized. I wanted to follow the line of white puffs but could not stop. Then, I realized that the pattern was not an out-of-the-ordinary one. My thoughts streamed as the smoke continued. 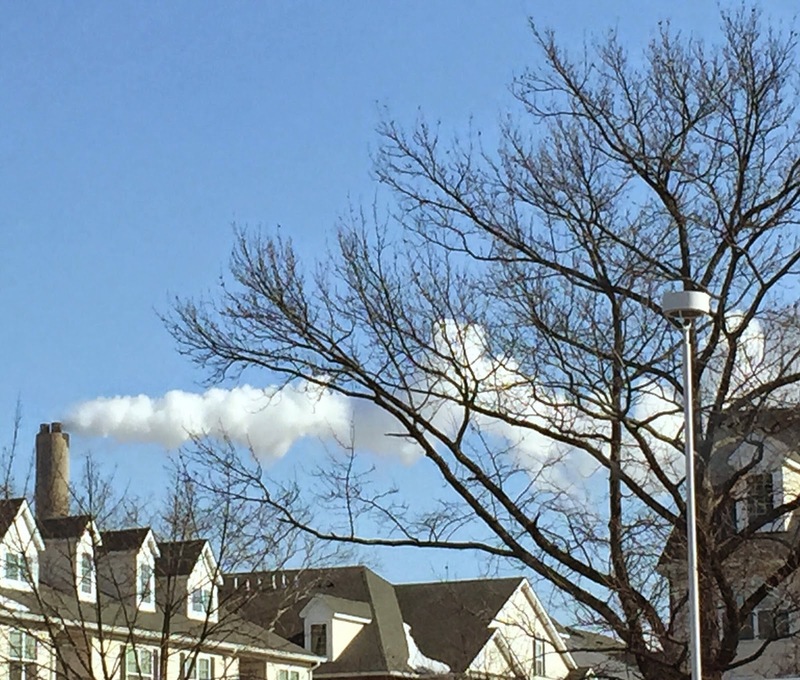 How many times were the puffs in the sky visible to me? How many cars ahead of me thought about this pattern? How many moments pass when I don't see life in front of me. I celebrate the small moments today that make me stop, pause, and reflect on where I am going and how fast I am attempting to arrive at my destination. Slowing down the pace may be the answer because you never know when one small moment stares you in the face and leads you to an aha moment in life. Please join Ruth Ayres at Celebrate This Week to discover how other bloggers are celebrating this week's journey. In the stillness of long winter days, sounds play an important role. One listens for the howl of the wind, crunching footsteps against a frozen earth, or the ping of rain as it hits the house. Laughter from children sledding or snowman making nourishes a neighborhood while shovels hit against snowy paths. Sounds break the stillness and interrupt winter's sleep. 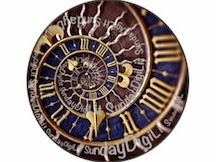 Today, I honor the 2015 Sounds Poem Project at Author Amok's site. While I have not officially participated in the daily writing ritual I have followed the poetry trail and resurrected some of my scraps of paper with random scribblings. I am intrigued by the sounds of winter this season and so to Laura I dedicate these two pieces. #1 is based upon the water wheel sound challenge. My mind wandered back to a small town in Pennsylvania that my family traveled to for a few vacations. There was a restaurant in the town that originally was a mill. The water wheel fascinated my children when they were little. When I heard the sound prompt, my mind wandered back to those days over twenty years ago. Now I take you to a poem written by Billy Collins that resonated with me. You can listen to the poem being read at the Poetry Foundation. Lastly, I would ask that all who read this post consider listening for the sounds of winter calling you to reflect and write. 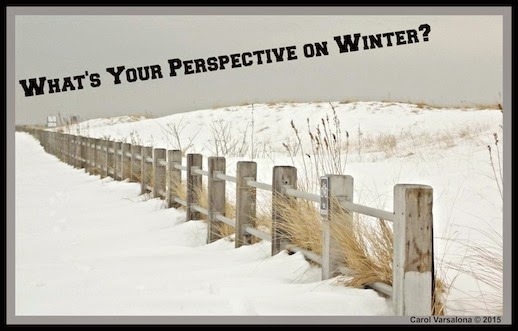 Join me in celebrating this season that may be giving us blasts of Arctic air on a daily basis but also provides us with the scenery, images, and sounds to write about. Offerings for the Winter Whisperings Gallery are due by the first week of March. Now, please stroll over to Teacher Dance where Linda Baie is waiting to greet all of her Poetry Friday guests this week. Recently, I read about an interesting site off the Florida Keys that piqued my interest. While I am not a diver, this magnificent site is one I would like to visit. A unique and unusual dive site off the coast of Key Largo, Florida has been drawing attention and attracting thousands of Scuba divers and snorkelers alike for more than just its reef and marine life. In the midst of this dive site, a spectacular bronze sculpture of Jesus Christ stands 81/2 feet tall in 25 feet of water with a grandeur like no other. 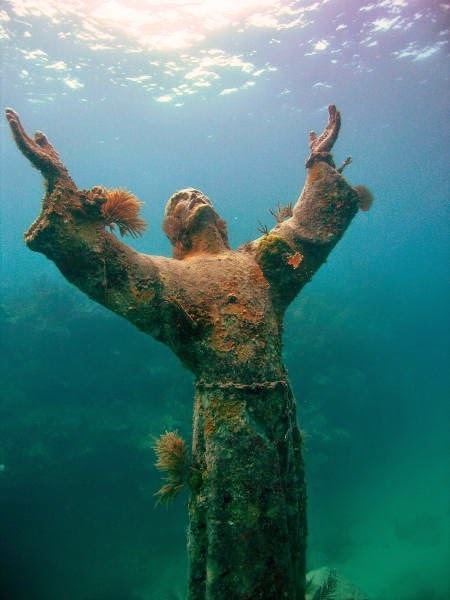 Christ’s arms raised towards the surface in a pose offering peace, the underwater statue has a presence that has made it one of the most famous and visited underwater sites on Earth. In reading the short text, I found words like unique, spectacular, Christ, grandeur, arms raised, peace, presence, and Earth popping out at me. I coupled these with resonating words from Steve Curtis Chapman's song, dive, rush, hear, voice, take a leap of faith, awesome power, grace, let ourselves, swept away. 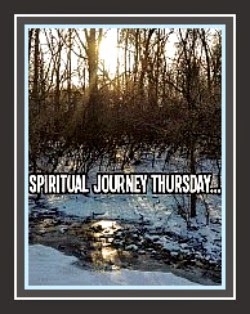 Then, the words developed into a poetic thought for the Spiritual Journey Thursday writing community. a rush of water floods my heart. I focus on the presence of Christ. I listen to His spectacular words of peace. With arms outstretched, He reaches for me. quiets my soul, restless from the winter chill. Listen to these words from Romans 10:17, "So then faith (cometh) by hearing, and hearing by the word of God." Know that if we take a leap of faith and dive into the living water, we will have a deeper understanding of the journey God is providing for us. Join Holly Mueller as she guides the Spiritual Journey Thursday bloggers around the topic of DIVE, Greg Armamentos' one little word that to him embodies the following words: Dwell, Ignite, Venture, Embody. It's Presidents' Day. Hearing the weather reporter say "for New Yorkers this is unfamiliar territory" makes me think that the ground hog had the inside scoop on a lengthy winter season for all of us long before he poked his head out. While the deep dive into winter allows more time to reflect on the beauty of the season, no one can deny the bite that winter is delivering. Winter is making New Yorkers get squeamish about weather reports. Stories are popping up all over the news. This morning, as I entered the doctor's office for an annual check-up, I felt a huge chill. It wasn't that the door was open because I was on the second floor. There was a distinct coldness in the office space. As I stepped closer to the reception area, I was shocked to find the office staff and doctor herself wrapped in various pieces of winter garb. They quickly recounted their story. When they came in a hour earlier, the office thermometer read 48 degrees. Brrr! Gloves and scarves were needed. Since this happened the Friday before, they were prepared. The doctor told me that she had on three pairs of socks and many layers under her lab coat. We had a good chuckle. The staff commented that I might want to keep my warm coat over my shoulder when in the examination room. As I traveled to toward that area, I felt the temperature dip. My coat was definitely going to accompany me. In the corner of the examination room there was a small heater. The nurse told me that she was trying to keep the room warm. In reality, the room was only slightly warmer than the ice-cold floor. I could not wait for the exam to be over. By the time I left, my feet and hands were so as cold as the air in the room. When I said good by, I felt sorry for the doctor and her staff since they had a whole day in front of them. At the 4:00 news, Lee Goldberg, the ABC News meteorologist, reported that Presidents' Day morning was the coldest morning in over a decade. I thought about the doctor and her staff once again and decided that the announcement would not make them feel better. I must add that the cold snap here on Long Island is not particular to Presidents' Day weekend. Last week, after the oil company filled our tank, my household lost heat for almost twenty hours. This issue, coupled with cold weather, reminded me of the days when my home town had no heat, electricity, and water for fourteen days during the Superstorm Sandy hit. While the current extreme weather is a disruptive factor for most Long Islanders, it can be tolerated if we think back on Superstorm Sandy. We are not accustomed to harsh weather conditions but instead of thinking negatively about winter, I continue my positivity campaign. The reality is that we have to adapt. There is no other recourse, so with the weather being such this winter, it is time to snuggle up with a cozy throw, a laptop, a book, or a writer's notebook in front of the fireplace. Isn't that what a holiday should be about-time to enjoy reading and/or writing? Because listen is my one little word for this year, I purposefully noticed the signs of winter today. I wondered how everyone else would react to the bitter cold weather. I noticed the lady who was huddled next to the building. She looked so cold. I listened to the stories of how people are handling or not handling the cold days. Winter seems to be trying some peoples's patience. I know that is happening in my household. Even though I am still cold from today's weather chill, I remain positive no matter how many layers I am wearing. It is the end of a very long, cold Presidents' Day. I sit in my office, listening to the sounds of the season-the furnace trying to pump out more heat, the outside wind, and the crackling of the virtual fireplace. 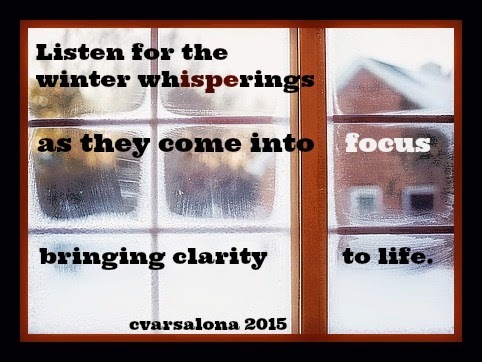 I am hoping that others will join me as I listen to winter's whisperings during this cold snap. 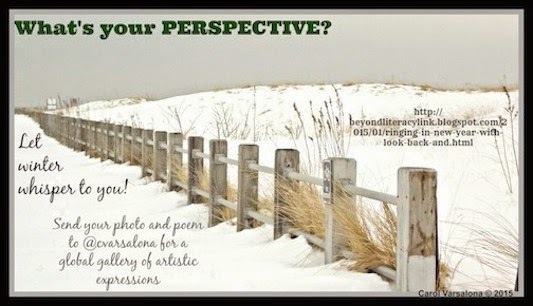 I continue to collect winter photos and accompanying poems from virtual and face-to-face friends and invite all who are so inclined to help me create a global gallery of artistic expressions, like the following: Finding Fall, Summer Serenity, April Awakenings, and REFLECT WITH ME. 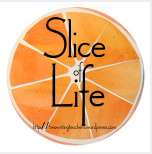 Now, that Presidents' Day is over, beat the cold and hurry on over to the Two Writing Teachers site where you will find Slice of Life blog posts. 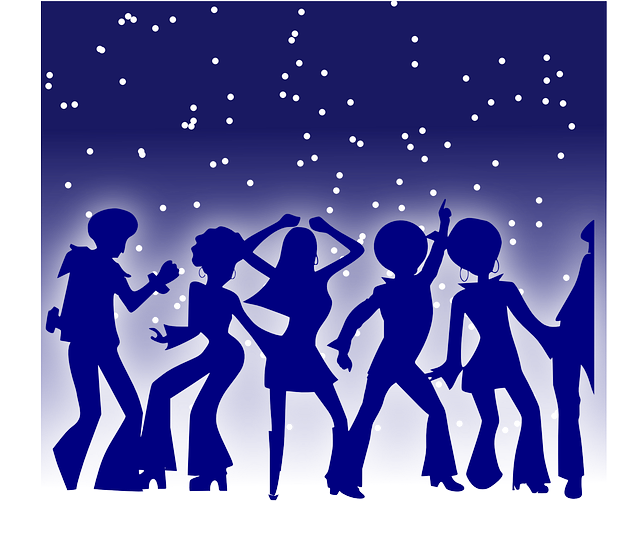 Warm up by reading the Tuesday slicers' posts. This week, I celebrate togetherness leading up to Valentine's Day. This is a special time of year for me, a week to celebrate family love and friendship connections. 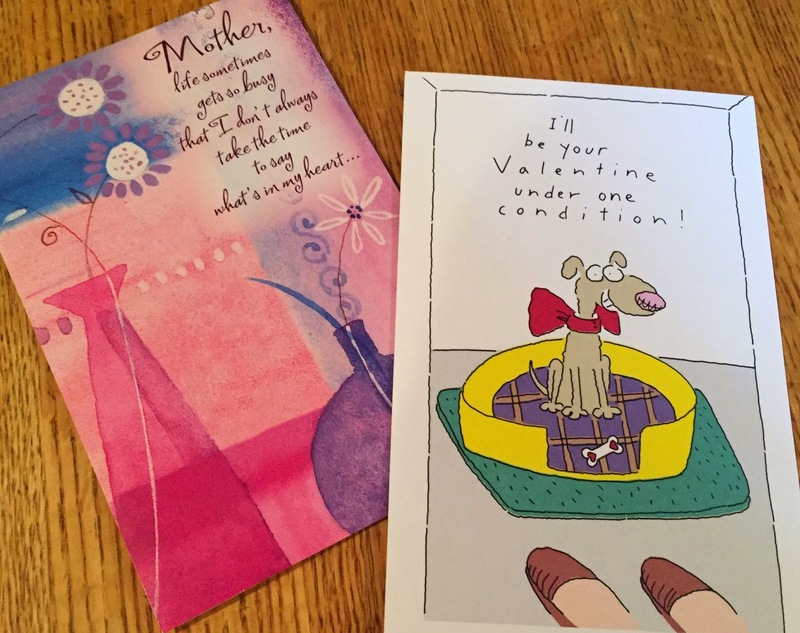 During the days prior to the Valentine's Day holiday, traditions take prominence in my life. 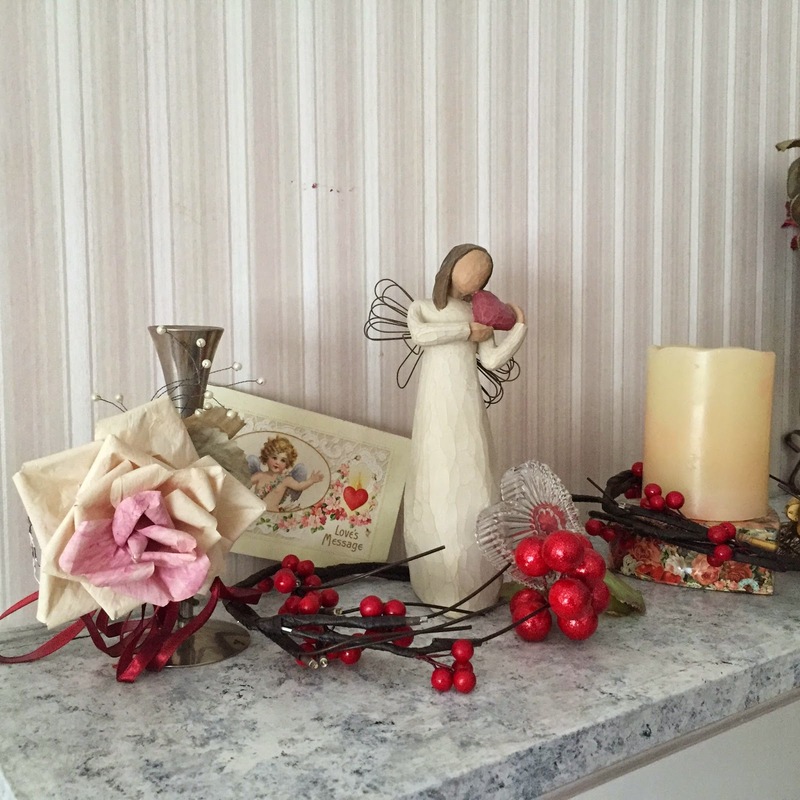 The house is decorated with antique and family memorabilia. 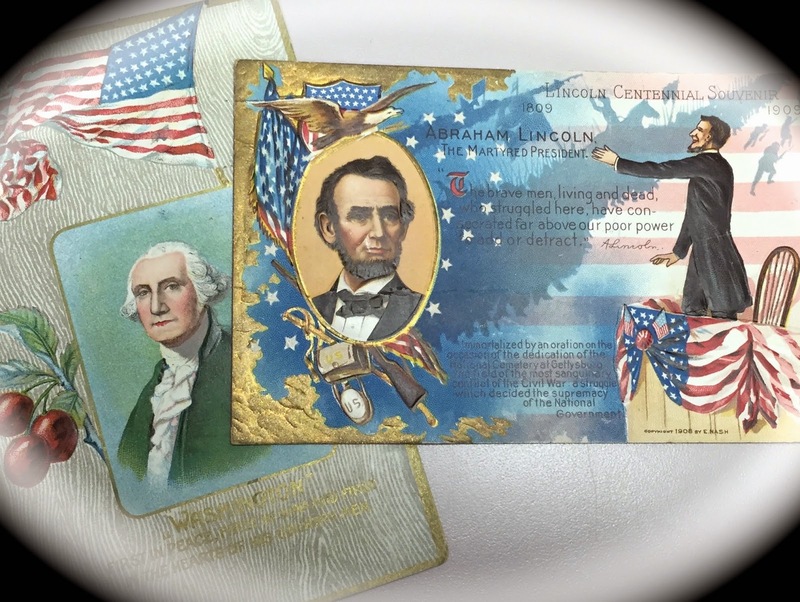 Cards are purchased by family members for loved ones and ephemera is proudly displayed, signifying bygone years of card giving. In addition to the decorations, we cannot forget a special dinner topped off by a Valentine's Day cake. The celebration is special and often brings back fond memories. 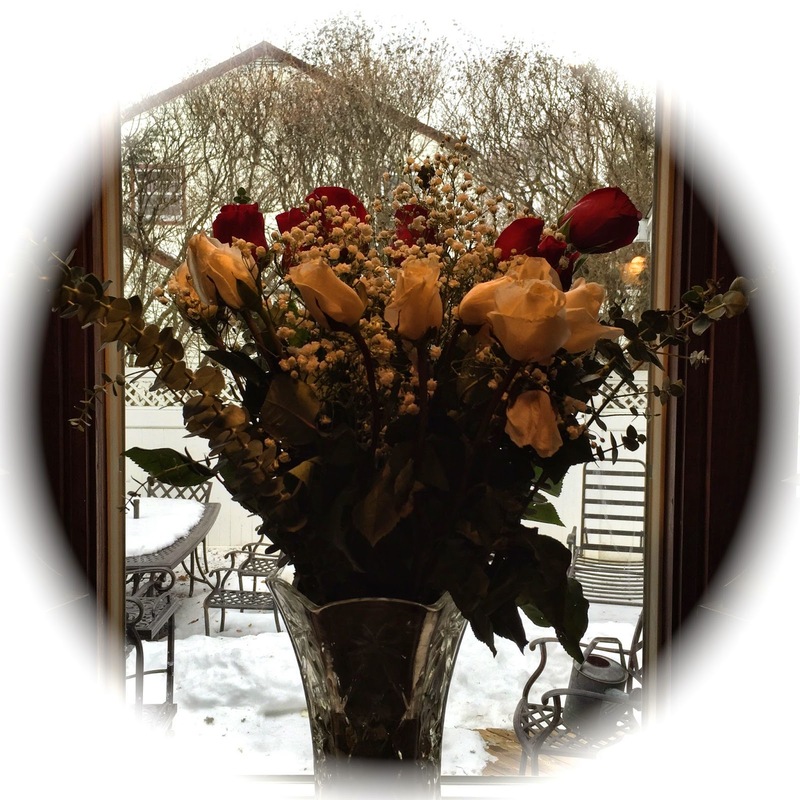 This year I was surprised by a lovely bouquet of red and white roses, carefully placed in my crystal vase by my husband and son. Surrounding the flowers were carefully chosen cards. While these were strategically placed in the kitchen, being in typically non-observant in the morning, I passed right by them until my husband called attention to the gifts. We had a good laugh over that. I surprised the two of them later in the day with a homemade cake. Here is my Valentine's Day thought. Hark to hearts that adorn my rooms. 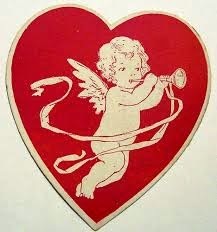 Hark to the cherubs singing their tunes. and sweet memories that linger awhile. Tribute to years of wedded ups - downs. Patience in togetherness knows no bounds. for love I honor in a special way. an oldie that my mother would have appreciated. Besides all of the family goings on this week, I celebrated togetherness in a writing community with teachers new to Twitter. 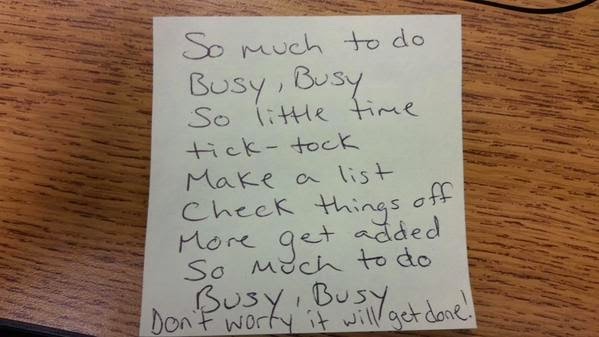 During a day long workshop on reflective writing, I led teachers through several exercises in which they created their one little word and an acrostic poem to accompany it, among other activities. A sample of the work that was shared on Twitter by the educators is below. is a special part of my life. 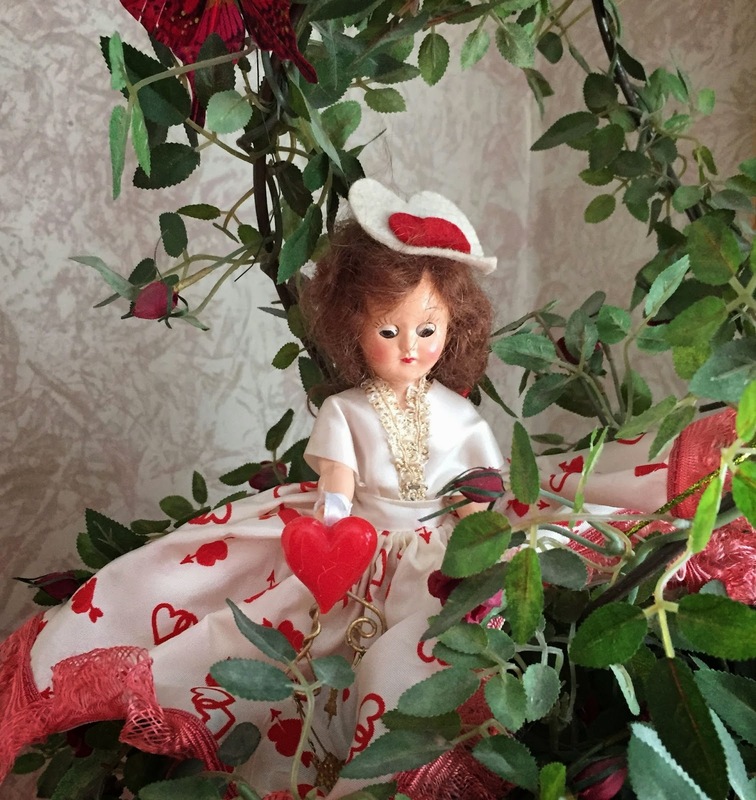 Now, follow the link to Ruth Ayres' Celebrate This Week site to hear how the community of bloggers celebrated their week leading up to Valentine's Day.